Timothy Brittain-Catlin, architect and architectural historian at the University of Kent, describes how the work of Leonard Manasseh and Partners expresses one of the central themes of the 1950s and 1960s: the apparent conflict between the architect as creative artist on one hand, and as rational technologist and scientist on the other. Leonard Manasseh and his partner Ian Baker were lauded for producing modernist designs that were in keeping with their historical settings or landscapes. 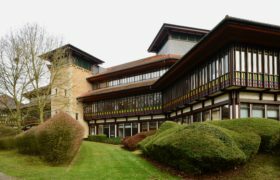 Examples include industrial buildings in rural settings, a study for Kings Lynn, undertaken with architect-planner Elizabeth Chesterton, and the project that is most commonly associated with the practice, the National Motor Museum at Beaulieu. This book is part of the Twentieth Century Architects series jointly published by RIBA Publishing, English Heritage and the Twentieth Century Society.